David with water hose, originally uploaded by The Bacher Family. As a father, of course, my favorite pictures of David, as he grew up, are those that show him playing happily with a big smile on his face. At the same time, there are occasionally photos in the collection that show a more richly-layered set of emotions, and that show hints of the complex and mature personality he has today. 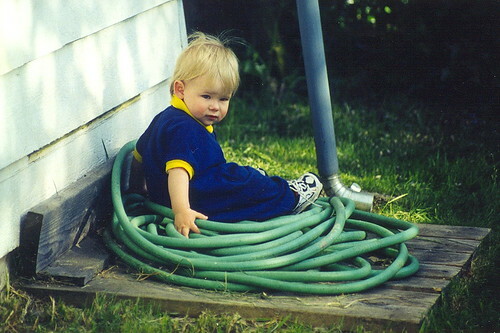 I love this photo for that reason, as David played by himself among a coil of hose at his grandparents' house in Albany, Oregon.